In Mali, the UN’s World Food Programme (WFP) is using flat boats to ferry food up the Niger River to communities like Timbuktu which have become hard to access as a result of the conflict. Travelling by boat is both safer and faster, allowing WFP to deliver food to areas which might otherwise be cut off. Here’s a photo of UN Headquarters taken the day after the greater New York City area was hit with a major blizzard. Thanks to our colleague @JimLandale for sharing the image. Peacekeepers from Chile brought school supplies and clothing to 120 children in an orphanage in Haiti. Thanks to @MINUSTAHMedia for posting this photo and more on their Twitter account. In Mopi, Mali, internally displaced persons receive food rations from the World Food Programme (WFP). Thanks to @WFP_WAfrica for posting this and more on their Twitter page. Get more information on the crisis in Mali on this UN News Centre news focus page. This mother from Mozambique gave birth on the roof of a house due to the threat of rising flood waters. The United Nations Population Fund (UNFPA) with its partners stepped in to provide her with postnatal care. Thanks to @UNFPA for posting this photo and more on their Twitter account. These children from the International School – Campus des Nations took part in a the recent Holocaust through the Arts programme in Geneva. Thanks to UN Geneva Information Service for posting this photo and more on their Facebook page. 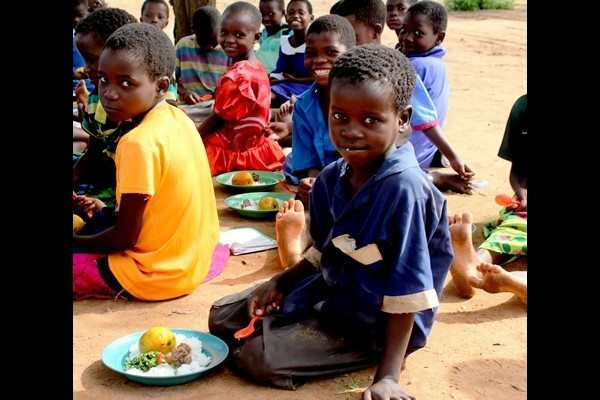 In Malawi, children smile as they receive the nutrition they need. Thanks to the World Food Programme (WFP) for posting this photo and more on their Twitter account. Last Monday was United Nations Association of America (UNA-USA) Members’ Day at the UN which included attendees of all ages like these young leaders. Find out more about the event in this Storify recap. The United Nations Relief and Work Agency (UNRWA) has opened a housing project for refugees in Rafah, Gaza, which means thousands of new homes for refugees. Thanks to @UNRWA for posting this photo of the housing project and more on their Twitter account. Petra Cadova (with microphone), former table tennis Olympian and currently Policy Officer for Director General for Health at the European Commission, attended the Cine-ONU screening of “Ping Pong” to celebrate the European Union Year of Active Ageing, and said in an interview: “Ping Pong is, in terms of active and healthy ageing, a life cycle approach.” Find out more and watch a video interview on this Facebook page. To observe the International Day of Zero Tolerance of Female Genital Mutilation/Cutting the United Nations Population Fund, UNICEF and the United Kingdom Department for International Development (DFID) hosted a Google+ Hangout discussion on the progress made in FGM/C abandonment, and the challenges that remain ahead.